In the debut issue of Vault Comics’ Friendo, we met Leopold, a down on his luck actor with a not so down on her luck girlfriend who buys Leo an expensive pair of smart glasses, Friendo. But the glasses are a little too intuitive as the artificial intelligence, named Jerry, begins to connect with Leo really. But by the end of the book, Leo had been stabbed and electrocuted, so how can it get worse? Written by Alex Paknadel, with art by Martin Simmonds, colors by Dee Cunniffe and letters by Taylor Esposito, this sophomore issue ramps up and shows us just how dangerous Jerry can be. We see Leo recuperating at home after being in a coma, but now more attached to Jerry than ever. When Leo finally gets out of his home, he runs into Josh, one of the people with him when he got attacked. This is when we see things take a dangerous turn, for Jerry, for Leo, and Josh. Jerry has attached himself so much to Leo that he is drawing out deep-rooted issues, like issues with Leo’s estranged, deceased father, and how it all connects to his favorite childhood toy, Action Joe. But the nature of Jerry, what he is programmed to do, is drive purchases, and if Leo has no funds, then Jerry disappears. It makes for a very volatile relationship, but a fascinating relationship for the reader. By the end of the second issue, we see Leo hit a brand new low, which makes you wonder again, can it get worse? As a reader who is loving this series, I cannot wait to see what the answer to that question is. Paknadel has made an almost technological version of the Genie from “Aladdin”’: I am sure Leo has never had a friend like Jerry, and by the end of it, he might wish he didn’t. 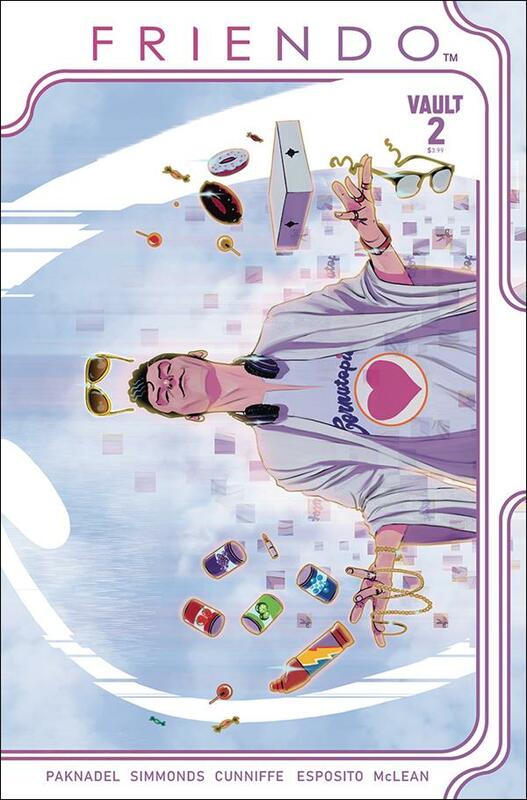 Friendo continues to impress, surprise and entertain throughout every page. Friendo isn’t your run of the mill book and deserves your attention. So check it out!